When friends and family gather from far and wide over the holiday season, awkward moments tend to be inevitable. This year, however, be the conqueror of confrontation, the hostess with the mostest, and the vanquisher of uncomfortable silence. How, you may ask? Over winter break, visit the Dallas Museum of Art and arm yourself with this gallery game—believe me, it’s more fun than a stale round of Monopoly! Suitable for all ages, distant relatives, and potentially odd social outings. Print enough cards for each member of your party to have at least one (or if you don’t have access to a printer, you can easily draw your own icons!). Cut out each individual icon and place in a plastic bag. Bring your whole group to an exhibition or gallery of the Museum of your choosing. 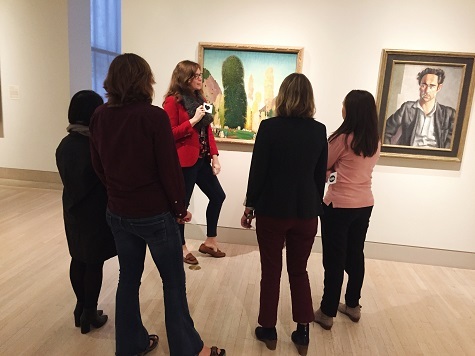 Once in the gallery you selected, give your group 10 to 15 minutes to explore. Bring the group back together, and then have each person in your group draw a card from the bag. Each person leads the group to the artwork they chose to match their card. 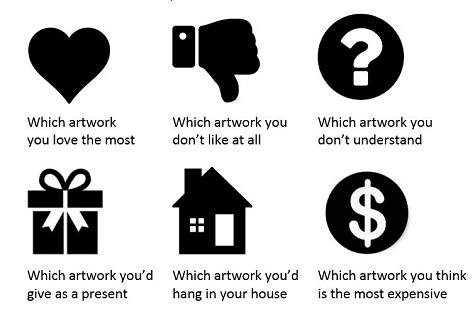 While at each artwork, discuss your findings. Why did you choose that particular artwork? Does anyone feel differently? Who would you give this artwork to? Why? Where would you hang this piece? Download the symbols here to print at home. After everyone in your group has gone, you can challenge yourselves to come up with your own cards, or go visit another part of the Museum to play again! Expand your visit with the DMA app! Get to know the collection in a new way with the tours found in the “Explore” section. Download the app now! Grace Diepenbrock is the McDermott Intern for Family and Access Teaching at the DMA.